Posh sponsors' man-of-the-match Erhun Oztumer races clear of Southend left-back Stephen Hendrie. Photo: Joe Dent/theposh.com. Peterborough United found it hard to show their best form in today’s (January 16) 0-0 draw with Southend United at the ABAX Stadium. 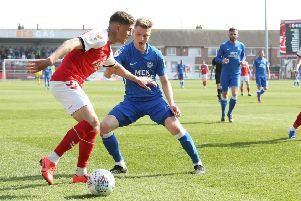 It was the first time in 18 matches that Posh had failed to score at home so perhaps understandably the Peterborough Telegraph man-of-the-match was central defender Jack Baldwin. Posh midfielder Martin Samuelsen in action against Southend. Photo: Joe Dent/theposh.com. Kgosi Ntlhe: (for Wilson, 74 mins).